NEW YORK, Sept 1  Pat Rafters bid for a third straight US Open title was brought to a premature end by injury, hours after Pete Sampras bid for Grand Slam immortality similarly skidded to a halt. Sampras, the world number one and top seed, rocked the tournament yesterday morning when he withdrew with a herniated disc suffered while practising on Sunday. COLOMBO, Sept 1  Sri Lanka celebrated its stunning victory over Australia in the three-nation tournament as if it was a repeat of their World Cup triumph three years ago. Well, who would have thought that the Sri Lankans would not only win the final but do an absolute demolition job on the Australians? MUMBAI, Sept 1  Indian skipper Sachin Tendulkar may skip the three-match Toronto Cricket Festival series against the West Indies and, instead, proceed to Australia at the conclusion of the Singapore tri-nation event which is starting tomorrow. CHANDIGARH, Sept 1  Indian captain Sachin Tendulkars century against Sri Lanka in the last outing of the triangular series helped him move up four places in the batting standings of the Pepsi one-day world cricket ratings. NEW DELHI, Sept 1  Delhis Ali Sher continued his love story with the Cosmopolitan Club Golf Course when he shot a seven-under par 65 round to open a two-stroke lead on top of the leaderboard at the end of the first day of the Rs 7 lakh Cosmo  Hindu Open in Chennai today. LONDON, Sept 1  Middlesex captain Mark Ramprakash has criticised England selectors for dropping him from the squad for the tour of South Africa later this year. NEW YORK, Sept 1 (AFP)  Pat Rafters bid for a third straight US Open title was brought to a premature end by injury, hours after Pete Sampras bid for Grand Slam immortality similarly skidded to a halt. Sampras, the world number one and top seed, rocked the tournament yesterday morning when he withdrew with a herniated disc suffered while practising on Sunday. Hours later, under the floodlights last night, a hurting Rafter retired after dropping his serve in the first game of the fifth set against Frances Cedric Pioline. The Frenchman, a two-time Grand Slam finalist was leading 4-6, 4-6, 6-3, 7-5, 1-0 when fourth seed Rafter walked to the net and told him he couldnt continue the first-round match. Its tough for the tournament, Rafter said. Especially with Pete playing such great tennis, and my form was pretty good coming into here. Sampras injury was frightening enough to make his decision less agonising, even though he had been hoping to capture his 13th Grand Slam singles title, eclipsing the record of 12 set by Australian great Roy Emerson and matched by Sampras with his triumph at Wimbledon last month. Rafter withdrew before his quarter-final at Indianapolis with the same shoulder tendinitis. He thought he had it licked as he prepared for his bid to become only the third man in the Open era to win three straight US Open titles. I felt something go, Sampras said. Like I was stabbed by a knife. It scared me. No question it scaredme. Sampras place in the drew was taken by lucky loser Mikael Tillstrom of Sweden, who will play Russian teenager Marat Safin today. Rafter looked ready to take full advantage of Sampras absence when he took the first two sets off Pioline, although in the second he twice had a trainer on during the changeovers to massage his shoulder. He was again treated without an injury stoppage after three games of the third, but Pioline broke him in the fourth game to take a 3-1 lead. I think his shoulder got a bit sore, he was not serving very powerful, Pioline said. Then I played a very good game to break him in the third set, added Pioline. Then I started to be more aggressive and more confident. Rafter couldnt muster another break point in the third, and he dropped his serve to trail 2-1 in the fourth  again after receiving treatment. He broke back immediately to level the set at 2-2, then saved one break point in the next game to lead 3-2. But a defeat seemed on the cards in the 10th game, when Pioline double faulted three times while serving to save the set, and Rafter still failed to earn even a break chance. Three of the top six mens seeds are now out. No sooner had Sampras withdrawal been announced than Englands number six, Tim Henman, lost 7-6 (7/1), 6-4, 6-3 to unseeded Argentine Guillermo Canas. Kuerten advanced with ease, posting a 6-4, 6-3, 6-7 (2/7), 6-7 (5/7), 7-6 (7/3) win over French qualifier Stephane Huet. American Lindsay Davenport launched her defence of the womens title with a 6-0, 6-3 victory over compatriot and doubles partner Corina Morariu. She was joined in the second round by fourth seed Monica Seles, who steamrolled Garman Barbara Rittner 6-1, 6-1, and fifth-seeded Frenchwoman Mary Pierce, who beat Yugoslav Sandra Nacuk 6-3, 7-5. Seventh seed Serena Williams followed elder sister Venus, the third seed, into the second round with a 6-1, 6-0 victory over Kim Po. NEW DELHI, Sept 1 (PTI)  Stylish batsman Rahul Dravid, boxer NG Dingko Singh, footballer Baichung Bhutia and middle distance queen Jyotirmoyee Sikdar were among 31 who were bestowed the countrys top sports honours by President K R Narayanan at a simple ceremony here. Pugilist Dingko Singh, who boxed his way to the bantamweight gold in the Bangkok Asian Games was the cynosure of all eyes and received the loudest applause as he walked up to receive the Arjuna Award from the President at the Ashoka Hall of the Rashtrapati Bhawan. Dravid, highest run-getter in the recent World Cup and wicketkeeper Nayan Mongia, the two cricketers in the list of Arjuna awardees, also received good applause from the packed audience. Dressed in pale yellow saree and sporting the widest smile was Jyotirmoyee Sikdar, who received the prestigious Rajiv Gandhi Khel Ratna Award for the most spectacular achievement among Indian sportspersons for 1998. The Bengal runner produced a grand effort at Bangkok in December by landing a golden double in the 800 metres and 1500 metres apart from a silver in the 4 x 400 metres relay. The Rajiv Gandhi Khel Ratna Award, instituted in 1991, is given for the most spectacular performance during the year under consideration and comprises a medal, a scroll of honour and a cash prize of Rs one lakh. Other prominent Arjuna awardees were quartermiler Paramjit Singh, who broke the legendary Milkha Singhs eternal 400 metres national record and won bronze at the Asian Games, woman sprinter Rachita Mistry, shooter and Commonwealth Games gold medallist Roopa Unnikrishnan and former national table tennis champion and India No 2 S Raman. The lone absentee among the Arjuna awardees was weightlifter Sateesha Rai, who is now taking part in the Asian championships under way in China. 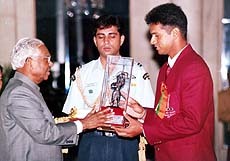 The Arjuna Award comprises a bronze statuette of Arjuna, a scroll of honour and a cash prize of Rs 50,000. Top athletic coaches, Bahadur Singh and Hargobind Singh and national boxing coach Gurbux Singh Sandhu received the Dronacharya award for coaching excellence. Guru Nanak Dev University, Amritsar was awarded the Maulana Abul Kalam Azad Trophy for its best all-round performance. The varsity won the award for a record 14th time. Unlike last year when batting maestro Sachin Tendulkars presence at the function resulted in total chaos, this year it was orderly conducted. Soon after the function, some children and their parents gathered around Dravid, Dingko Singh and Bhutia for autographs but there was no pell-mell unlike last year which saw even the security personnel chasing Tendulkar for autographs. It was a touching moment for all gathered here when Chanchal Surjit Singh, wife of late hockey Olympian S Surjit Singh received Arjuna Award from President Narayanana on behalf of her husband. Surjit Singh, who represented India in the World Cup and Olympics, was the highest scorer of 1973 Amsterdam World Cup. While the crowd was after Dravid, Dingko Singh and Bhutia, Rhodes scholar Roopa Unnikrishnan, who flew down here from the USA to receive the award, caught all photographers imagination. The President was repeatedly requested to pose with Roopa and the trophy while some 50 flashguns exploded. I feel fantastic to be here. Ive yet to get over the jet lag but Im savouring all the moment, she said. Star striker Bhutia, who recently signed with English second division club Bury FC said he was not expecting the award so soon. The government has recognised my talent and achievements, a humble Bhutia said. The Sikkim-born footballer said playing in English conditions would be the new challenge for him. I should really work hard. I dont have any target as such, but I want to do well, he said. Stumper Nayan Mongia, recuperating from the injury which has forced him to sit out of the team, termed it as a life time achievement. Olympian Mohammad Riaz, member of the Bangkok Asian Games gold medal winning mens hockey team, thanked all those who encouraged him to take to the sport. Rajiv Gandhi Khel Ratna Award Jyotirmoyee Sikdar (athletics). Arjuna Award: Athletics  Neelam J Singh, Rachita Mistry, Siri Chand and Paramjit Singh, SD Eshan; body-building  I V Pauly; boxing  NG Dingko Singh; cricket  Rahul Dravid and Nayan Mongia; football  Baichung Bhutia; hockey (w)  Pritam Rani and Omana Kumari; hockey (m)  Surjit Singh (posthumous), Baljit Singh Dhillon, Mohd Riaz, Baldev Singh and M K Kaushik; judo  Narender Singh; kabaddi  Ashan Kumar and Biswajit Patil; kho-kho  Shoba Narayana; physically handicapped  Anju Dua and Ranjini Ramanujam; shooting  Roopa Unnikrishnan and Manavjit Singh; swimming  Bhanu Sachdeva; table tennis  S Raman; weightlifting  Satish Rai; wrestling  Kaka Pawar and Rohtas Singh Dahiya. Dronacharya award: Athletics  Hargobind Singh and Bahadur Singh; boxing  Gurbux Singh Sandhu. MUMBAI, Sept 1 (PTI)  Indian skipper Sachin Tendulkar may skip the three-match Toronto Cricket Festival series against the West Indies and, instead, proceed to Australia at the conclusion of the Singapore tri-nation event which is starting tomorrow. The worlds premier batsman is set to leave for Australia from Singapore to consult Dr Greg Hoy, who had operated leg spinning great Shane Warnes spinning finger last year, for his back problem which flared up in Sri Lanka and forced him to miss a match in the AIWA Cup tournament, Mumbai Cricket Association sources told PTI today. Tendulkar is to be accompanied to the antipodes by Mumbai-based sports medicine expert, Dr Anant Joshi, who had flown to Chennai to treat him when the master batsman had a recurrence of his back problem during the short camp for the team prior to its departure for Colombo last month. Cricket board president Raj Singh Dungarpur confirmed that Tendulkar was flying to Australia, but said at present he was planning to do so at the end of the three-match series against the Windies at Toronto on September 14. Yes. At present that is what he plans to do, go to Australia and get medical advice (on his recurring back problem). We, at the board, are fully with him and will give him our full support and co-operation in whatever he decides to do, Dungarpur told PTI earlier today. Mr Dungarpur also said the board had left it entirely in the hands of the master batsman on what he intended to do, whether to take rest from cricket or not. That is for him to decide. He is a responsible, young man. I basically feel he would like to get himself examined thoroughly to try and find out the cause of the back problem which arises off and on, the board chief said. Tendulkar has been advised by Warne, with whom he seems to have developed a good friendship off the playing field after visiting Sir Donald Dradmans house in Adelaide in August last year to meet him on his 90th birthday, to get examined by the same doctor who treated the leggie. Mr Dungarpur also said Tendulkars recurring back problem seems to be one of those which is puzzling the medical fraternity. All the MRIs and other tests have shown that nothing was wrong with his back. Tendulkar first faced the back problem last January during the Chennai Test against Pakistan and had to take a short hiatus from international cricket at the end of the Asian Test championship series. He skipped the tri-series at home and the tri-nation even at Sharjah in order to be fully fit for the May-June World Cup. It was revealed in Colombo by board secretary Jaywant Lele a couple of days ago that the master batsmans back problem flared up during Indias campaign in the mega event too. COLOMBO, Sept 1 (AFP)  Sri Lanka celebrated its stunning victory over Australia in the three-nation tournament as if it was a repeat of their World Cup triumph three years ago. Parties continued into the early hours today after skipper Sanath Jayasurya lifted a massive six to round off an eight wicket victory over the Australian  who suffered their first defeat since their World Cup triumph in June. Sri Lanka passed Australias 50 over total of 202 in 39.3 overs. Wicketkeeper Romesh Kaluwitharana was named man-of-match for his unbeaten 95. There were several angry exchanges. Fast bowler Glenn McGrath erupted at Kaluwitharana as he conceded 47 runs in his seven overs. One over cost 20 runs. Victory almost erased Sri Lankas humiliating exit from the last World Cup. Lanka brings world champs Aussies down to earth with a thud, screamed the banner headlines in the state-run Daily News. 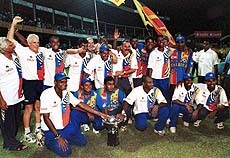 Newspapers stopped the presses to bring out the Sri Lankan victory in the day-night final in the tri-nation tournament that also included India. Sri Lankan opposition leader Ranil Wickremesinghe was among the first to congratulate skipper Jayasuriya saying radical changes made to the team had paid dividends. Australia were hot favourites to take the AIWA Cup having won all their preliminary round matches against Sri Lanka and India. Sri Lanka won only one group match, against India, but made it to the finals on a better net run rate than the Indians, who suffered fitness problems. UNI adds: Coach Dave Whatmore expressed hope that the Sri Lankan team would perform much better in the coming Test series against Australia as it had already proved beyond everybodys imagination. The Sri Lankans were on fire. The bowling and fielding set up proceedings and then the batting, led by the irrepressible Romesh Kaluwitharana completely blitzed the Aussie assault. It is easily the best one-day innings I have seen from little Kalu. If I was the Sri Lankan coach I would be grabbing the tapes from this match and sitting Kalu down in front of them to show him how he can quite easily become one of the leading batsmen in the world. We have seen glimpses of his talents over the years. I have vivid memories of this young man playing in his first Test, scoring one of the best centuries Ive ever witnessed. We all thought he was Don Bradman in disguise! But, by the end of that series he was out of the side. This is the point. He has been erratic in performances. All the talent in the world will get you so far, its what you do with that talent that matters. Well, it mattered yesterday and Kalu gave us a startling display of the awesome talent the possesses and he did it without slogging! Hopefully, this will be a breakthrough innings for Romesh and he will realise the enormous potential that he has at his disposal. The Australians would have been quite happy with the way the day started for them. In hot humid conditions, winning the toss and batting first on a wicket that looked like it might become more difficult in the second session Steve Waugh would have thought everything was going to plan. It was good to see Sri Lanka try something a little different by opening the bowling with Arnold. The move didnt work initially but by the end of the Australian innings the Sri Lankans spinners had done the damage. To me, one of the big improvers in this tournament has been Upul Chandana. Again yesterday he was magnificent. Before this tournament started I expected Murali to hold the key for Sri Lankas success but as things turned out he played second fiddle to the other spinners in the camp, namely Chandana, Jayasuriya and Arnold. The Australians, having had their troubles on the slow wicket that offered a fair amount of turn, were a little surprising with their own tactics when the Sri Lankans turn came to bat. Yes, by all means try and blast away early with McGrath and Gillespie to get early wickets but it became very evident that this wasnt working. Maybe a few overs from Darren Lehmann or Mark Waugh might have been the go or even get Andrew Symonds to bowl his off spinners rather than medium pace. It is always easy to be wise after the event because essentially it was the quicker men who had caused all the trouble for India and Sri Lanka in the preliminary games, so you can understand Steve Waugh sticking to that formula. The Australians run of success has come to a shuddering halt. They have been magnificent over the last six months and unfortunately for them saved their worst game for the AIWA Cup final. Overall, I believe it has been a very good tournament. I still maintain the Australians, although losing the final showed why they are the world champions. On yesterdays form the Sri Lankans appear to be on the right track with the promotion to the top side of a host of excellent young cricketers. The Indians left their run a little late and now must regroup, make sure they dont leave all their best performances to revolve around the brilliant Sachin Tendulkar. Other senior players must stick their hands up and take some pressure off. If this happens, Sachins back is sure to be OK having taken such a load off his shoulders. Tendulkar climbed four places from the 10th place to take the sixth spot on the eve of the Singapore one-day tournament with 5831 points. Tendulkar leads five Indians in the batting list after Rahul Dravids indifferent form in the recent tournament saw his points slump to 4994 and left him in the ninth place, one below last months eighth position. Eighth-placed Ajay Jadeja (5395 points) 10th-rated Sourav Ganguly (4971 points) and 14th-ranked Robin Singh (4227 points) are the other Indians in the list of 19 batsmen meeting the qualifying mark of 250 runs during the current season. South African Lance Kluseners World Cup heroics keep him in the top slot with 9782 points, followed by New Zealander Roger Twose (9530 points) in the second place. Australian captain Steve Waugh (7081 points) has dropped one spot to the third place after the Sri Lankan triangular. India and Australia head the country-wise break-up with five men each among the top ranked batsmen, followed by three South Africans and two batsmen each from Pakistan and Sri Lanka , New Zealand and Zimbabwe are represented by one batsman each. Robin Singhs success with the ball in recent matches got him the sixth place among the 17 bowlers who made the qualifying mark of 12 wickets in the current season. Sixth-placed Robin Singhs 8259 points got him the pride of place among the three Indian bowlers in the select group. Medium pacer Venkatesh Prasad is placed 15th with 7746 points and his new ball partner Javagal Srinath lying 17th with 7182 points. Australian leg spinner Shane Warnes lack of form in Sri Lanka saw him drop down from the top spot to the fourth position with 8318 points. New Zealander Geoff Allot now heads the bowling standings with 8743 points, followed by second-ranked Zimbabwean Neil Johnson (8570 points) and third-ranked South African paceman Alan Donald (8446 points). Pakistan leads the country-wise break-up of bowlers with five men among the top 17, followed by three each from India and Australia. Two bowlers each from New Zealand and South Africa and one each from Zimbabwe and Sri Lanka complete the list. At the 6,654-yard, par-72 course, the twice Indian Open champion was followed by the defending champion Gaurav Ghei at five-under 67, while last two seasons Order of Merit winner Vijay Kumar was among three tied for the third place at three-under 69. The other two on joint third place are Delhis Gast Ram and Rezwan Ali of Calcutta. Ali Sher, winner here in 1997, played exemplary golf but fell one stroke short of his own course record set in 1996 and equalled in 1997. In all, the stocky Delhi player made eight birdies, the first of which came on the second hole. Ali Shers only blemish came in the form of a bogey on the very next hole, after which he never missed any opportunity till messing a four-footer birdie putt on the 18th hole. I feel extremely confident at the moment and I think I have a good chance of winning this title. Though I played well overall, I think my chipping was excellent today, said Ali Sher, whose other birdies came on the 4th, 6th, 7th,11th, 14th, 16th and 17th holes. Ghei, the defending champion, started off in cavalier fashion making a hat-trick of birdies on his first three holes. In fact, Ghei deviated from par on eight of the first 10 holes. He made bogies on the 5th and 7th holes and birdies on the 6th, 9th and 10th holes to be four-under at that stage. Thereafter, he made pars before ending with a birdie on the final hole. LONDON, Sept 1 (Reuters)  Middlesex captain Mark Ramprakash has criticised England selectors for dropping him from the squad for the tour of South Africa later this year. After all the calls for change, it looks like my name has come out of the hat, The Sun Newspaper yesterday quoted him as saying. Im not happy about it at all and I feel Ive been made a scapegoat, he said. Ramprakash, overlooked in favour of former captain Alec Stewart, was the only senior batsman omitted from the 17-man tour party announced on Monday. Graham Thorpe had already declared himself unavailable for family reasons. David Graveney, Chairman of the England selectors, said at the time that the choice had been between Stewart and Ramprakash. We thought it was in Marks long term interest for him to have a rest. People want Mark to express himself as he does in domestic cricket. His future with England is not finished, said Mr Graveney. LAUSANNE, Sept 1 (AFP)  The Court of Arbitration for Sport yesterday banned former Australian Open champion Petr Korda for a year after prohibited substances were detected in his urine samples during the 1998 Wimbledon championships. The ban, which lasts until August 31, 2000, is academic as Czech Korda retired after this years Wimbledon but the arbitrators upheld the appeal filed by the International Tennis Federation (ITF). Chandigarh, Sept 1 (BOSR)  The North Zone Open Table Tennis Tournament will be organised from September 17 to 19 at Sector 23 table tennis hall. The three-day meet, which will witness players from Punjab, Haryana, Himachal Pradesh, Jammu and Kashmir, Delhi and Chandigarh ,will be organised by Rotary Club ( central) under the aegis of Chandigarh Table Tennis Association (CTTA). The tournament would be conducted for cadets (under 12), sub-junior (under 14), junior (under 17), men and women singles and mixed doubles categories. Entries close with Secretary, CTTA on September 14.